First there was Hollywood, then Bollywood, and now "Dooleywood" — at least for the week of April 4-9. Dooley's Week celebrates the movies with a packed schedule of events starring Emory's skeletal Lord of Misrule. History and Traditions: Who is Dooley? First there was Hollywood, then Bollywood, and now "Dooleywood" — at least for the week of April 4-9. 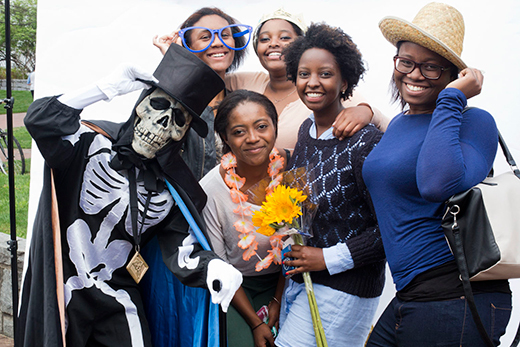 That's Dooley's Week at Emory, celebrating the University's unofficial skeletal mascot and Lord of Misrule. The theme "Dooleywood," playing off of Hollywood, was chosen as being "inclusive to all of the student body" as everyone loves to watch movies, says Dooley's Week co-chair Emily Warner, 17B. Honored with a statue at Asbury Circle and traveling the campus with his entourage, Dooley bestows a week of entertaining activities, including performances, films, food, photo opportunities and more — culminating with the Dooley's Ball concert, this year featuring The Chainsmokers. The week debuts with food and music in Asbury Circle at 5 p.m. This event, "Dooley's Week Premiere," is a collaboration between the Student Programming Council, responsible for Dooley's Week, and the Indian Cultural Exchange. There'll be an obstacle course for adventure, the opportunity to get a henna tattoo, a photo booth, and Chick-fil-A and Indian food. The film "Gun Hill Road" will be screened at 7 p.m. in the Harland Cinema following the premiere event. The screening is in collaboration with the Office of LGBT Life. Also Monday, Emory's top dance groups perform in the AHANA Showcase at 8 p.m. in the Performing Arts Studio. Cost is $7. A repeat performance will be Wednesday at 7 p.m.
On Tuesday morning, celebrate "Thank a Donor Day" in Asbury Circle at 10 a.m. Take funny photos and create custom postcards to thank those who help fund Emory. McDonough Field will be the scene for "Taste of Emory" with a variety of food vendors from 5 to 7 p.m. Pizza Bella, King of Pops and Shake Shack are expected, among others. "Couchella," designated as Emory's Music and Arts Festival, starts at 6 p.m. in Asbury Circle and features guest spoken word artists and poets Steve Roggenbuck, Martín Bell and Jessica Caldas. Student performers include Shea Fallick, Sara Frank and Aidan Williams, Cooper Linn, Persuasion Dance Crew, Boregard and Rathskellar. "We envision students and faculty coming to Taste of Emory, grabbing some food, and moving along to Asbury to watch the performances," says Warner. TableTalk Emory, the Pulse and Literature Is Alive @ Emory are presenting Couchella. "The Huntsman: Winter's War" will be shown at 8 p.m. on Tuesday in White Hall, Room 208. The Student Programming Council event "Old Hollywood" will be in Asbury Circle from 12:30 to 2:30 p.m.
"During this event we will have a limo stationed for photos, King of Pops, popcorn, food trucks, as well as a station to create your own flip books," says Warner. Another film screening, "Love Jones" from the Black Student Alliance, will be at 8 p.m. in Harland Cinema. "Toy Story," the throwback movie, will be screened at 5 p.m. in Eagles Landing. Thursday's concert will feature DJ Khaled, who will perform at 8 p.m. at McDonough Field. "Urban Dance: Emory," a performance by multicultural dance groups, including hip-hop groups, is scheduled for 4:30 p.m. in Asbury Circle. Comedian Pete Holmes performs at Glenn Memorial Auditorium, with doors opening at 7 p.m. The Latino Student Organization hosts "Noche de Máscaras" from 10 p.m. to 2 a.m. in Cox Hall Ballroom, bringing the community together to celebrate Latin culture with dancing, great desserts and a general good time, says Bessie Frias 18C. The Chainsmokers will be this year's artist for the Dooley's Ball concert, considered the highlight event of Dooley's Week. They will perform at McDonough Field at 8 p.m. Prior to The Chainsmokers' performance, a block party on sorority and fraternity lawns will be held from 3 to 5 p.m. There will also be a pre-concert Dooley's Ball Picnic at 6 p.m. on the Freshman Quad. "Bring a blanket and friends," says Warner. Food will be provided by Emory Dining. For more information, see the Dooley's Week 2016 Facebook page.